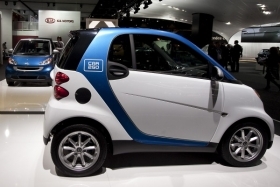 A Smart car modified for the Car2Go rental service. BERLIN (Bloomberg) -- Daimler AG, maker of the Smart city car, is stealing customers from Mazda Motor Corp. and Fiat S.p.A. with rentals aimed at drivers ready to forgo auto ownership. Daimler's Car2go service, which rents Smart cars by the minute in Austin and the German town of Ulm, will add Hamburg early in 2011 and is in talks with “dozens” more cities in Europe and North America, said Robert Henrich, the unit's chief. Daimler is competing with Hertz Global Holdings Inc. and Zipcar Inc. for a share of an industry likely to surge 12-fold to $7 billion in revenue in Europe and North America by 2016, according to a Frost & Sullivan study. The growth reflects a shift in people in their 20s and 30s, who see car ownership as a financial drag with little status upside. That view challenges the traditional auto business of making and selling vehicles to people like Niran Babalola. The 25-year-old director of technology at an Austin non- profit organization, who prefers to ride his bike, uses Car2go when he's running late or can't get sweaty. He says he's forgoing a car to make a social statement. Car sharing is attractive to younger drivers in part because they grew up with monthly cell-phone bills and are accustomed to pay-as-you-go services. The lack of parking also complicates car ownership in crowded city centers, the main target of Car2go and other such offerings. The trend is pushing automakers including BMW AG and PSA/Peugeot-Citroen to develop services to woo these consumers. Car2go, which only offers the two-seat Smart, differs from competitors by allowing consumers to rent by the minute rather than the hour. It doesn't charge for distances as long as the trip is less than 150 miles (240 km). The system, based on GPS technology, allows users to end a rental anywhere within the city's operating area, making one-way rentals the norm. Other car-sharing models typically require the cars to be returned to their home station. Like Eder, Andreas Neukamm, a 43-year-old graphic designer from Ulm, which has 120,000 residents, has given up on car ownership. He sold his Fiat Barchetta roadster in 2008 and joined Car2go in its first week in March 2009. He now spends about 100 euros ($133) a month on Car2go to meet 90 percent of his transportation needs. “I'm not thinking of buying a car again,” he said. “It offers all the flexibility I need.”That attitude presents both an opportunity and a challenge. A car-sharing fleet of 150,000 to 200,000 cars could eventually replace about 1 million consumer-owned vehicles, Kumar estimates. “Over the long term it's a threat, because they're helping consumers get out of owning a car,” he said. Still, automakers don't have much choice because ignoring the trend would mean missing out. The number of consumers seeking car-sharing services may rise to more than 9.8 million worldwide in 2016 from about 900,000 last year, according to Frost & Sullivan's report, which was published last March. Daimler will expand to Hamburg, Germany's second-biggest city after Berlin, in the first quarter. The addition of Hamburg, which has 1.77 million residents, and growth in Austin and Ulm, will more than double the fleet to 900 cars from 400. Several more cities will probably be added in 2011, Henrich said. BMW, which outsells Daimler's Mercedes-Benz, is experimenting with short-term rentals in Munich. PSA, Europe's second-biggest carmaker after Volkswagen AG, began offering subscription-based access to Peugeot cars, vans, scooters and bicycles in 14 European cities last year. The Citroen brand has also introduced a service providing short-term access to a vehicle within three hours. A Smart customized for Car2go rolls out in February, featuring solar panels on the roof to power the electronics and cool the car in hot weather. The model also has more robust seats, upgraded radios and navigation systems and automatic start-stop, which shuts down the engine at traffic lights, to save fuel. 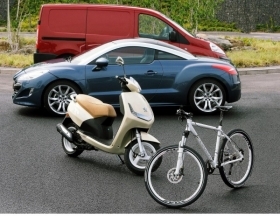 PSA offers subscription-based access to Peugeot cars, vans, scooters and bicycles in 14 European cities. Car2go members pay a one-time registration fee for an access card to rent a car located wherever the last customer parked. The pretax usage fees in Austin, which include mileage, fuel, insurance and parking, are 35 cents per minute, discounted to $12.99 for an hour and $65.99 for a day. In Ulm, the per- minute rate is 0.19 euros. In Hamburg, where Daimler is teaming up with rental agency Europcar Groupe SA, the per-minute fee will be 0.29 euros. Eder, who uses Car2go to fill gaps in Austin's mass transit system, has an application on his Apple Inc. iPhone to locate the nearest vehicle, typically less than four blocks away. There have been hiccups. Earlier this month, a car that appeared on the digital map wasn't there in reality, leaving him temporarily stranded. Even so, he's not going back to owning a car and figures his Car2go bill is less than his insurance payments.